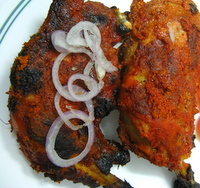 Tandoori chicken recipe is one of the most popular Indian chicken recipes. Butter Chicken is made from this tandoori chicken. In hindi tandoori chicken is called tandoori murg. A Tandoor is a clay pot in which cooking is done by heating the coal. The marinated chicken is inserted in big skewer and put in the tandoor to bake. To have such an appliance at home is probably not possible, hence to get a similar taste as the tandoor, we need to use the oven. Making a tandoori chicken is not difficult at all. You need to marinate the chicken for a good 7-8 hours or over night in the refrigerator. You do need a tandoori masala powder, which is easily available at any Indian supermarket. Wash and pat dry the chicken and cut slits on the meaty parts with a sharp knife. If the chicken is big, then rub a mixture of lime juice, salt and some ginger garlic paste, in the slits and keep aside for 20 minutes. If the chicken is not too big then proceed with the regular marinade. In order to ensure that the marinade sticks well on the chicken, you have to make sure that the marinade is not too watery. For this we will take out as much water from the yogurt and ginger garlic paste. To do this just tip all the yogurt onto a sieve (lined with a muslin cloth/cheese cloth or use a sieve with very fine net). Place the sieve over a bowl (container), so that all the water gets collected in it. Leave this for 6-8 hours (or at least 1 hour definitely), inside the refrigerator. Now all the water would have collected in the bowl below and you will be left with a lovely creamy yogurt. In a similar manner, squeeze out the water from the ginger garlic paste. Either by putting in a sieve and pressing with the back of a spoon or by squeezing it with your fingers. Now add this yogurt and ginger garlic paste in a bowl. Add the rest of the ingredients and mix well. Sneak a taste and adjust the salt or chili if need be. Rub this paste in the slits and all around the chicken pieces. Coat well and marinate for 6-7 hours, even overnight if you want. At this stage you can add another step which is optional to get some more flavor in the chicken. This is how you can get a Smoky Aroma in your tandoori chicken recipe. Now place the chicken pieces on a baking tray and cook at 250°C for 15 minutes each side. Then grill for 5 minutes each side for a charred effect. Baste (brush the chicken, so that they remain moist) in between with the marinade. Serve hot with mint chutney and lachcha salad (onion rings with lime juice). Squeeze some lime juice and chaat masala on the chicken if you want. Enjoyed this tandoori chicken recipe? Here are some more quick easy chicken recipes for you.